Happy Monday! We’re in slow motion over here at Shed52, enjoying a leisurely holiday weekend of hosting two of our favorite relatives from Cleveland and eating more pizza than should be legal in most states. Beautiful days like this one (70s and sunny here!) remind us why we deal with such a temperamental climate and high cost of living in Boston. Fall will be here before we know it, but we’ll be getting as much time outside and on restaurant patios as weather will allow. If considering brunch to be a food group is wrong, I don’t want to be right. I might also be procrastinating a little by spending the weekend brunching around outside, since I’ve started taking classes toward a PhD (social workers are a special kind of masochist) and French toast is much more appealing to me than French theories on human social development. At least, for now. And speaking of procrastination, Jason’s been totally avoiding enjoying thinking about the ways in which he contributes to clutter in our house. Since he’s not likely to make an actual list, we… um… collaborated… to share his top 5 clutter culprits in our over-crowded space. I may have taken some liberties in sharing photo evidence of these adorable idiosyncrasies, mostly as a cry for help, and partly in an attempt to garner sympathy. Jason, I love you. Please don’t break up with me. I don’t even know where to begin here (though you may recall my reference to Jason’s “Bibliomania” in a previous post) but Jason loves books. As in, we once had a conversation about what we could never live without in life and for Jason, books came before both me and his children. I’ve been told that Jason takes after his dad in his love of books, which is deeply heartening and a sweet tribute (Jason’s dad passed away several years ago) and it seems they both had a wide-spanning love of all genres, authors and subjects. Which is great! Really! Except Jason doesn’t just read books. He owns them. He has to buy them, borrow them, order them, and then store them. We have 1000 books JUST IN OUR LIVING ROOM. That’s not an exaggeration. I counted once. (Yes, I know I need a hobby.) And we have just a measly thousand in the living room because that’s all she can hold. That means our dining room, breakfast nook, bedroom, garage and basement also have books. Jason and I almost broke up once over a storage unit he couldn’t get rid of, because books. In sum, books haunt my dreams. A sampling of what I found on Jason’s nightstand this morning. You may note the irony that Jason has a very non-zen attachment to books on Buddhism. 2. Papers. Just Like, Random Papers. I know what you’re thinking right now, because I’ve peered into the minds of normal people before and I know that normal people would be thinking “But Rach! Books are MADE from paper. Haven’t you already covered this?” I envy you, normal people. No. I haven’t covered this. “Papers. Just like, Random Papers.” gets its own subheading because this is a type of clutter that accumulates on a whole ‘nother level. It creeps in from every corner of Jason’s world. He uses scraps of paper as bookmarks for his bajillion books he’s simultaneously reading. He uses paper to take down phone numbers instead of putting them into his iPhone like everyone else does. He writes down thoughts that he has and wants to remember instead of just remembering them. He’s kept every single sales receipt from every. single. purchase. he’s. ever. made. They’re in a giant garbage bag somewhere in this house, and that is just terrifying. But it’s not just the accumulation of papers that contributes to the cluttered chaos of our living space. It’s how they coexist with us in the space. Jason (who I swear is my favorite person) has a way of manspreading his papers around the house such that they take up every possible inch of every possible surface we have. Tabletops, counters, couch cushions, buffets, consoles, and even the tops of our clunky old radiators usually have scraps of paper, or Jason’s manuscripts, or sheet music strewn across them. Jason insists that he needs to do this in order to know where things are. I’m pretty sure he does it because otherwise he’ll forget they exist. Needless to say, we’ve managed to accept one another for our different orientations to reality, which usually means I’m tidying, stacking and sorting papers and Jason steps in just to spread everything out again. Have I mentioned yet that I really do love him? I fully realize that this next item may not count, per se, in terms of how one brings in things that contribute to clutter in the house, but Jason’s not writing this and so I have creative license here. I’m mentioning this one because I think I’ve burned more calories closing drawers, cabinets and doors in the past year than doing probably anything else. I don’t know what it is, but Jason (and both of the kids) have this baffling habit of opening, say, every single cabinet in the kitchen, and then just LEAVING THEM OPEN. FOREVER. I’ve joked (okay I might have been crying) about coming home to a house that looks like it was raided by a poltergeist, but no amount of coaxing or operant conditioning will convince them to just close things after they open them. I call it the “invisible man” because no one ever seems to be able to determine exactly who does it, because it’s literally everyone except me. I realize it doesn’t add to clutter, technically, but by god, what good are doors and drawers if they’re not masking over the shame of clutter!? They have one job. If this kitchen looks cramped and awful, that’s because it is. And also because every cabinet is open in it. Real talk: Does anyone else have partners or families who do this? I’m half ready to fund a sociology student to do their dissertation on this phenomenon. I need answers. It won’t. I’m not just talking about mix tapes and CDs (Jason’s a musician, so I’ve resigned myself to living in an apartment that’s always going to have like 5 more Phil Collins albums than ever needed to be made). I’m talking about computer keyboards from 1992. I’m talking about extension cords that kind of look like they were actually invented before electricity was. I’m talking about VHS tapes, and weird pottery that will never come out of our garage, and okay, yes, I’m also talking about those Phil Collins CDs. We have a Spotify Premium account, for godsake! And yes, Jason still owns every single computer he’s ever owned since the late 80s. He also still owns every word processor and electric typewriter he’s ever had. They don’t turn on. They don’t contain any information he’ll ever need or be able to access. But we’ll be damned if we’re going to free up some prime real estate in the garage by throwing out the world’s most expensive paperweights. Free to a good home. Just kidding. We’re crazy. Your eyes have not deceived you! I’m giving books a whole second section because a) SERIOUSLY SO MANY BOOKS, and b) because really, Jason is a pretty simple, wonderful guy who puts up with a lot from me and all he needs in life is books, coffee and some quiet time to think each day. 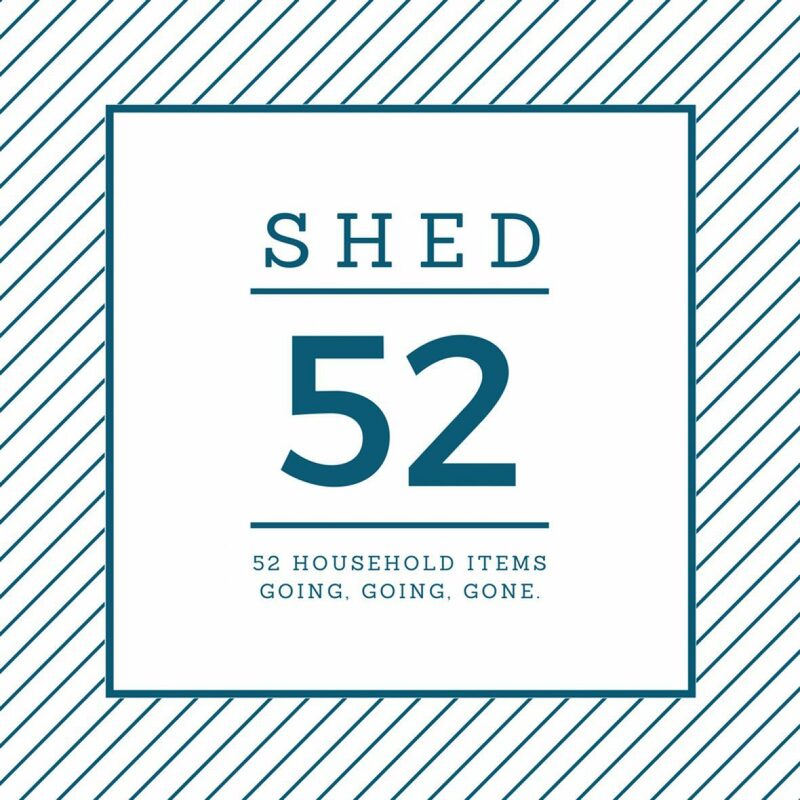 Shed52 has, if nothing else, helped me realize that I am actually the one who contributes the most to the “stuff” in our house, with purchases, freebies, tchotchkes and furniture. Jason knows how to live in a space in a way that makes him happy, and he actually doesn’t require many material things to do that. Unless you count each individual book as a separate material thing. Which I usually do. I might be giving Jason a hard time about the burdens of living with a bibliophile, but the truth is that Jason never complains about anything. His natural disposition is warm, thoughtful and friendly and that’s probably why he’s never met a book he didn’t like. And that’s also probably why books are his best friend, and why they all live with us at Shed52. Jason’s besties. Pay no mind to the tribute being paid to the compact disc. So there you have it. Jason may contribute to the cluttered ways in which our space gets lived in, but I nobly accept that I’m the one who acquires the most stuff. By taking a closer look at our own habits, we’ve already begun to treat our space differently, which is an unexpected but positive byproduct of this silly blogging adventure. And if you’ve gotten to the end of this post and are wondering whether I’m also procrastinating about sharing whether we managed to sell/get rid of our Week 4 item the answer is yes (yes, as in, I’m procrastinating. not yes, as in, we sold it). We’re not telling yet, so you’ll have to check back in later at Shed52 to see whether we bounced back from our struggle to sell, or if we dropped the ball! What kinds of funny habits have you noticed in your family members/ partners/ fur babies that contribute to the chaos of a cluttered house? I have to know I’m not alone here. Share below, and maybe gather the whole family ’round to read this post too. You thought those cabinets were filled with non-books? Don’t be ridiculous. Thank you for following me! I love your blog. It’s such a neat idea, and your writing is captivating. This is my favorite post so far (of the 3 I’ve read) because it really entertained me. I think Jason and I are very alike in our collection of books, papers, and obsolescent items… but I am definitely the one in our (my and Jonny’s) household that contributes the most to clutter. Jonny is the calm, pleasant, lovely one. I’m the whirlwind of emotions and /things/. Haha. Anyway, that wall of books is a DREAM, and I’m super happy to have found your blog. Oh, my gosh, haha! I understand your pain… but also Jason’s. My books are (almost) always my first things to unpack, too. I like to contemplate where they go (alphabetical order or by size? Harry Potter always has to be at the forefront) and have them all just right. But I will admit that did change this last time — because I had nowhere to put them! They ended up waiting months until Jonny bought us shelves. That said, I definitely wouldn’t move everything to paint either. What’s the point? No one will see behind the shelves. AND if you had painted behind the shelves, the walls would be a different color by the time you move out because of exposure to the sun/whatever. So you’d have to paint again anyway. Haha one day I’ll write a post about how I once tried to be all Pinterest-inspired and proceeded organize all the books by COLOR and I thought Jason was going to have a stroke. Now we just stick to his method of never putting anything away.